I made this last night, combining the last banana I had on-hand and frozen blueberries that had been sitting in my fridge for months. 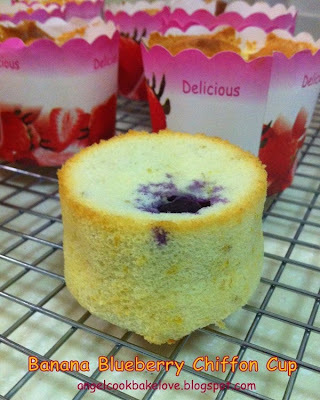 I flipped through my latest recipe book collection, 《好吃戚风轻松上手》and decided on this Blueberry Chiffon Cake. Basically, all chiffon recipes from this book are without raising agent. Instead, one extra egg white is used to build up the volume. The recipe I adapted called for 60g of blueberry jam; coincidentally the banana that I had also weighed 60g. So I replaced the jam with mashed banana. The result? 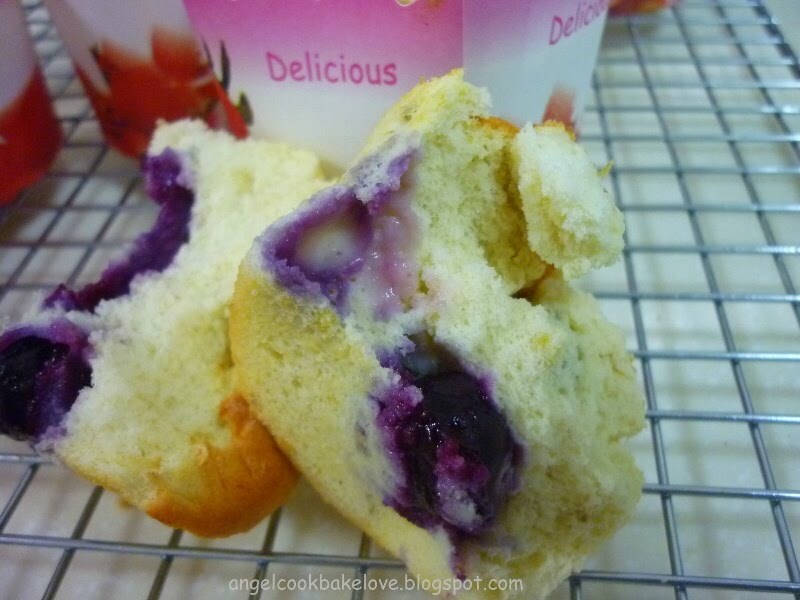 The chiffon cups are light, cottony soft and fluffy but they shrink quite a lot after removing from the oven. I am not sure if this is because chilled/leftover egg whites are used instead of fresh one. I noticed the meringue appeared to be matte, not as fine and glossy as it supposed to be. The taste? Hint of banana flavour with juicy and sour blueberries. The blueberries I bought during promotion are the sourest blueberries I ever taste but I think they compliment the sweetness from the banana. I am submitting this to Aspiring Bakers # 5: Fruity March (March 2011) hosted by Jess of Bakericious. 1) In a bowl, manually whisk yolks and blueberry jam/mashed bananas. 2) Add oil and whisk till combined. 3) Sieve in flour, mix till incorporated (*I found the mixture very dry, so I added 2tbsp of milk which is not in the original recipe). 4) In another bowl, whisk whites will frothy, then add sugar in 3 sessions. Whisk till stiff peak (when lifted, the tip of the meringue is stiff). 5) Fold in 1/3 of the meringue to the yolk mixture, mix well. Then pour the mixture to the remaining meringue, fold till just incorporated (original recipe add the remaining meringue to the yolk mixture). Fold in blueberries with a rubber spatula gently. 6) Fill up ¾ of the paper cups with the batter, bake in preheated oven at 180C for about 15 minutes, centre rack. 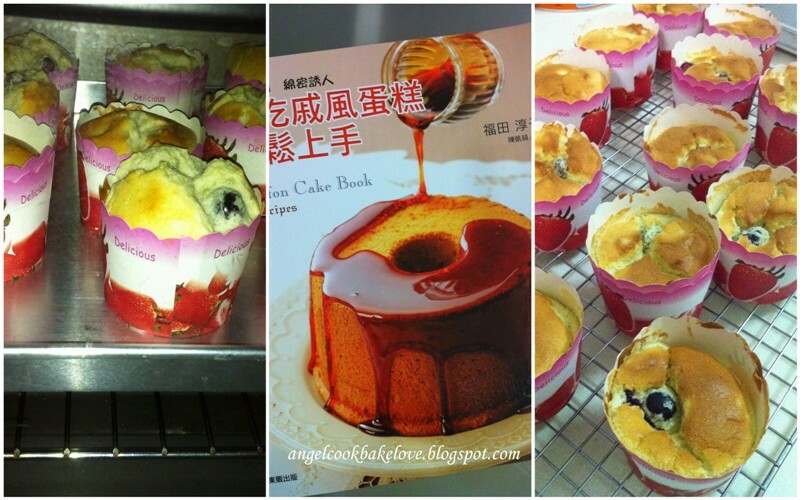 For 17-cm chiffon pan, bake for about 30 minutes. 7) Remove from oven and invert the cake immediately if bake in chiffon pan. Need not invert if bake in paper cups. Do not thaw frozen blueberries. Take them out from the freezer just before use and wash over running tap water. Pat dry and coat with flour to prevent sinking. chanced upon your space while blog hopping...awesome space you have with interesting recipes.. When bananameets blueberry, they fall in love with each other!! Hehe. Looks yummy and moist too ! it look so soft and yummy! blueberry and banana is a nice combination! (: great choice! May I noe how to noe how long to bake if we r to use a say 21 cm chiffon tin? This recipe amount is meant for 17cm chiffon tin. If u are using 21cm I am afraid your cake will end up be very flat. For 21com pan, you can try using the below amount. Bake at 180C for about 40 mins. 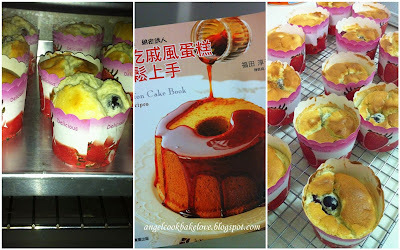 I m baking this cake now ~ First time baked no chance to eat .. Already finish . So today bake it again. Haha hope that this time you have chance to taste ur own creation.